After yesterday's "healthy" post, I have to catch up by posting something extra un-healthy today! Just kidding! I'm trying to post one healthy recipe per week going forward as I've had a number of requests from my readers for healthy recipes including - low fat, low sugar, diabetic friendly, gluten free and dairy free! I'm going to do my best to try to post a variety of these recipes over the next year. If there is anything you'd like to see me make, or you have a healthy recipe you'd like me to feature, by all means, please leave me a comment or send me an email. I would love to hear from you! I found this recipe on Jen's blog Food & Whine. She has a great online recipe box full of amazing recipes - so if you haven't already, do check her out. She doesn't post every day but whenever she does post I'm always excited to see what new recipe she is sharing because they're always good!! 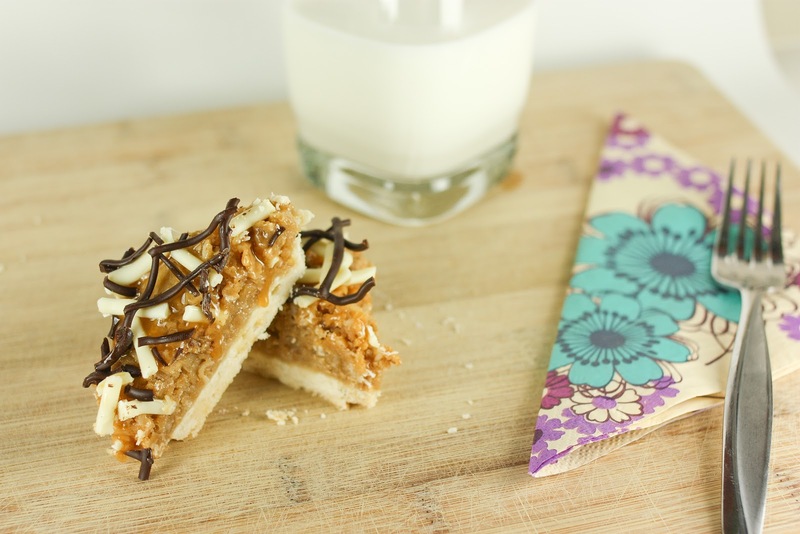 I made these macaroon madness bars and they're so delicious I just have to share them with you. 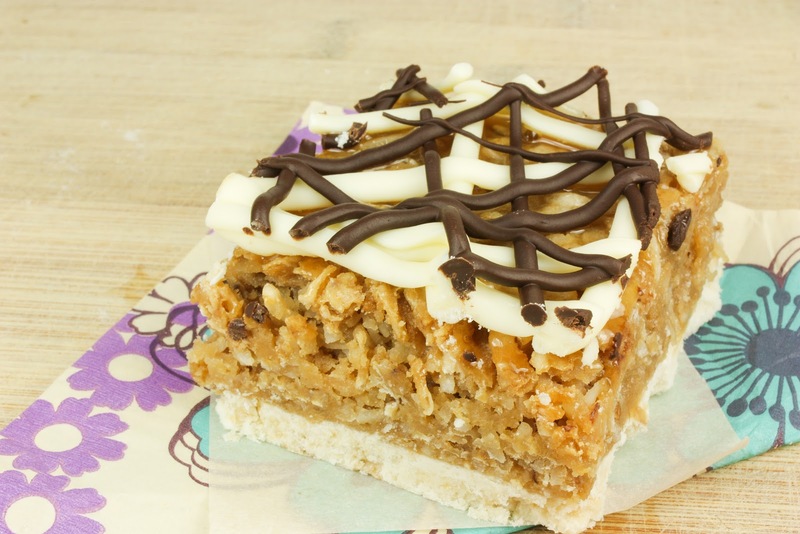 If you love coconut, you'll fall hard for these little beauties. Jen notes that you should leave them overnight in the fridge before slicing them and she's right. I let them soften a bit to room temperature prior to slicing and they were a little messy to slice. For the base, line a 9x13 inch pan with parchment paper and spray lightly with cooking spray. Leave an overhang of parchment on each end to lift out of the pan easily after baking. Combine butter, flour, cornstarch, and baking powder in a medium bowl. Mix until mixture is well combined and crumbly. Press into bottom of prepared pan (use the bottom of a glass to really pack in the crust). Set aside. Preheat oven to 350F. For the filling, over low heat, combine the butter, brown sugar, vanilla and sweetened condensed milk. Stir until sugar is dissolved. Remove from heat and stir in eggs. Fold in coconut and oatmeal until well combined. Pour over crust in prepared pan. Bake in preheated oven for 25-30 minutes until golden brown (center will still be a bit jiggly). If the center is too wobbly, cook for another 5 minutes. Cool completely. Cover, refrigerate overnight. 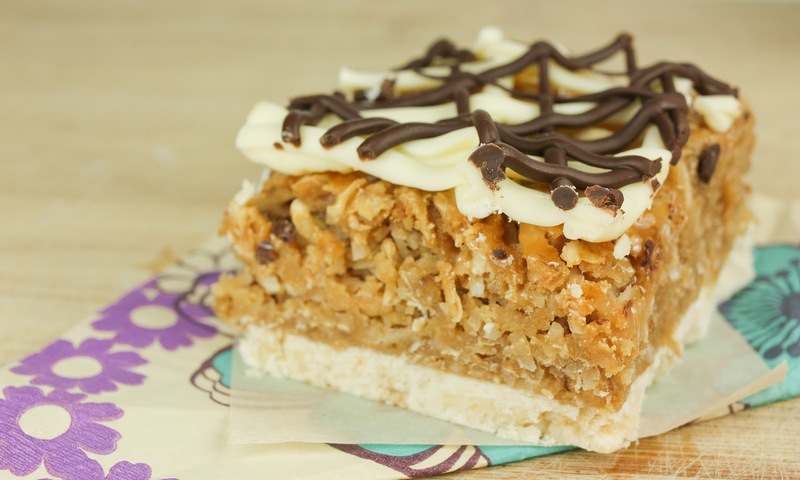 Drizzle bars with caramel syrup. Place back in the refrigerator for 10-15 minutes. 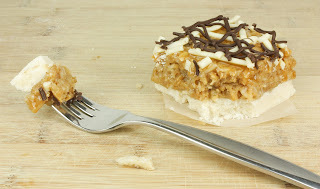 Then melt the white chocolate and drizzle over the bars. Refrigerate another 10-15 minutes. Finally, melt the chocolate and drizzle over the bars. Refrigerate another 10-15 minutes or until chocolate is firm. Remove from pan and slice into squares or triangles. Keep left over bars in the fridge, or freeze for later use. Hope you enjoy these bars! I know we sure did. I've actually saved some of the leftovers in the freezer (and by freezer, I mean my patio - its -8 again today, so no need to take up valuable freezer space when I have a big one outdoors!!) for a girls get together I'm having at my place on Sunday. Oh its going to be a good time - we're going to get a valentines card making tutorial from one of the ladies and what kind of girls get together would be complete without a friendly chocolate tasting competition?! I'll let you know how it goes and obviously give you the DL on what kind of food I make next week. This post has been linked up with Whatcha Baking Wednesdays over at Cajun Sugar Pie. Head on over to check out what other delicious desserts have been whipped up this week by fellow food bloggers. This post has been linked up with Jane Deere's Fusion Fridays! Please stop by the Fusion Friday's link party to check out what everyone else was cooking up this week. Those look delicious! 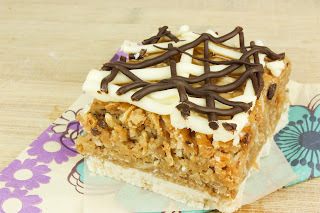 Thanks for sharing them at Whatcha Baking Wednesday! I need this bar in my life! Oh my goodness, they look SO good. Yes you do!! These are absolutely amazing. :)Thanks for stopping by! How To... Whip Cream in Under 60 Seconds!